With AllSeated’s 3D floorplan software, easily design floorplan layouts and view in 3D, take virtual walk-throughs, arrange seating charts, and more! AllSeated continues to transform the event industry from paper-and-pencil to an all-digital platform by providing 3D floorplan software with collaborative 3D planning tools that allow venues, caterers, planners, vendors and hosts to work together on creating memorable events. 2D event diagramming is quickly becoming a relic of the past. AllSeated’s 3D floorplan software provides you the opportunity to build floorplans in minutes with the option to view in stunning 3D using a few simple tools. Select from a wide variety of table and furniture sizes, shapes, and styles available from within AllSeated’s furniture library. Place and move tables and furniture, join tables, customize the spacing between tables, knock off chairs, and save templates for future events. Include spacing for dance floors and entertainment while also marking exits into the room. Easily switch views from 2D to 3D viewing at any time to take a virtual walk through of the floorplan layout. Using AllSeated’s 3D tool, see your floorplan from above via Bird’s Eye View. Alternatively, you can also walk through the layout via 1st Person View as if you were Taking a virtual walkthrough of your floorplan in 3D helps to ensure that you’re 100% satisfied with the layout before the day of your event. Collaborate with your clients to arrange the seating chart. 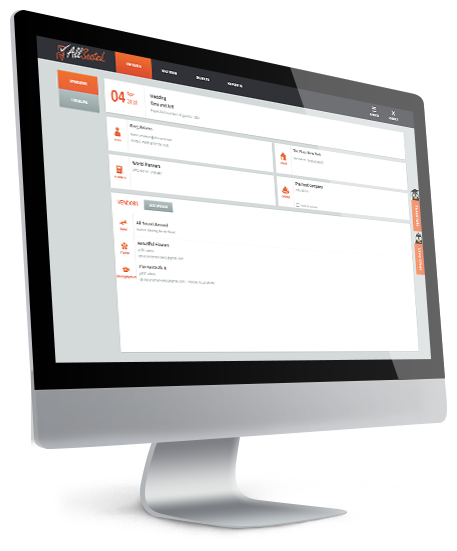 AllSeated’s state-of-the-art guest list features a direct link to seating to easily seat guests at the tables that are positioned in the floorplan. 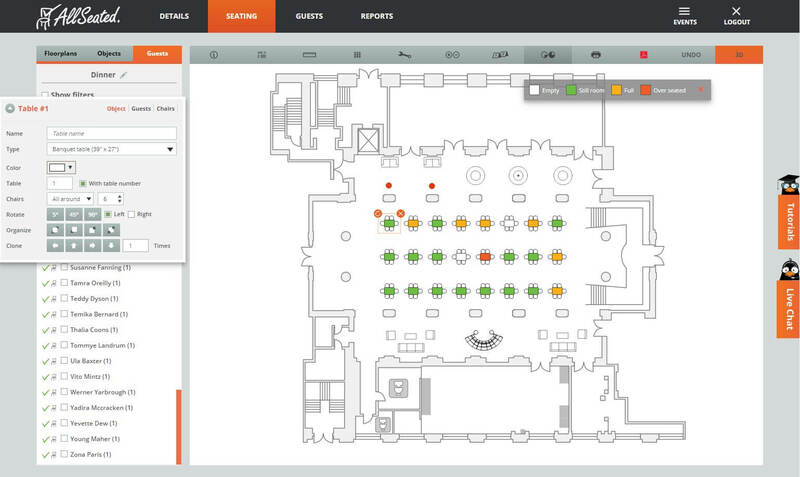 AllSeated’s 3D floorplan software also offers the option to seat guests at specific seats if needed. You may wish to reserve specific seats for VIP’s, guest speakers or simply assign seats for specific tables (or even all guests) within your floorplan. AllSeated’s 3D floorplan software offers the opportunity to drive more business through our game-changing Virtual Reality and designer tools. Our simplicity, speed and elegance brings your event planning experience to new levels and saves you time in the process. Using AllSeated’s Virtual Reality tool, experience an event before it even happens. AllSeated’s special virtual reality goggles allow you to tour your future event layout in a realistic simulation. Learn more about AllSeated’s Virtual Reality tool and the three easy steps for getting started here. With AllSeated’s VR, clients can view a venue’s property and event space regardless of where they are in the world. Prospects are able to tour an event space in a 360 degree view from anywhere at anytime. This allows for a digital, life-like walkthrough of the venue. With the AllSeated VR, clients can have an onsite experience without actually having to step foot on the property! Learn even more about AllSeated’s VR by watching this video. AllSeated’s 3D floorplan software provides designer tools to build to-scale tabletop and buffet displays within your floorplans. There’s no more guesswork as AllSeated’s designer tools will show you exactly what can fit to-scale on a tabletop. The table builder and buffet designer tools currently have options for place settings, flowers, centerpieces, linens, and buffet pieces, with many more objects to come. AllSeated’s Day-Of Mobile App for tablets is an extension of AllSeated’s 3D floorplan software, giving you access to your event on the go. The Day-of Mobile app offers a full check-in system including real-time collaboration, live check-in updates, overview of check-in status and ability to view your floorplans in both 2D and 3D. The Day-Of Mobile App also allows you to let your guests know where they are sitting while also keeping track of who is in attendance, and who is unaccounted for. The Day-Of Mobile app also gives you direct access to your master seating chart.